Though my schedule being back in the US this summer has been busy, when I learned that Lee Magpili was going to be in town, I cleared my schedule. I first met Lee when I was working with the Bronx FIRST LEGO League initiative several years ago. He was a quiet presence in comparison to the energetic middle school students that attended our workshops to play with LEGO robots, but I quickly learned of his prowess with building with LEGO elements. His rovers navigated the FLL field with ease and used mechanisms that balanced simplicity with effectiveness. Eventually he mentored an FLL team to do exceptionally well. Like all great FLL coaches, however, he insisted on the students doing the work. In our conversations at that time, I quickly understood that Lee believed (and continues to believe) that LEGO is an amazing platform upon which to learn an enormous range of useful skills. Robotics, in particular, capitalizes on the unique blend of play and learning through LEGO to get students to understand the engineering design process. Lee is a believer in the potential for students to be quickly engaged and motivated to work hard when the right tools are around. It was consequently no surprise when I learned Lee had been selected for a job with LEGO education in Denmark a couple of years ago. He and I wrote back and forth periodically about the position and what it entailed, but for a while our conversations turned noticeably away from the details of his work. I figured this was just a consequence of the distance and I left it at that. 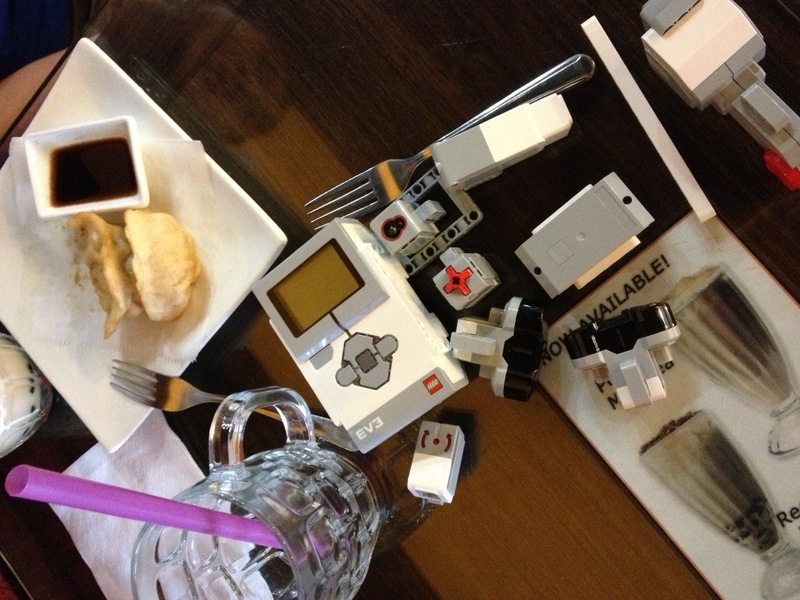 Lee sat down with me at Saints Alp Teahouse in New York for some bubble tea, snacks, and conversation about the EV3. 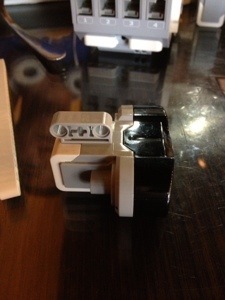 What struck me was that Lee's enthusiasm for using LEGO as a learning tool hasn't just been maintained, it has grown considerably since becoming part of the EV3 team. As you might also expect, he was excited to show me the bits and pieces of the kit that will be coming out in August. From a LEGO designer's perspective, the attention to detail in acknowledging the desires of the LEGO fan community and the limitations of the NXT set will most definitely be appreciated. There are some subtle changes that made me excited given my own experiences building with the curves of the NXT and its parts. Lee also spoke a lot about the care that he and the team have taken to make the bar for entry with the kit low, and the ceiling high. 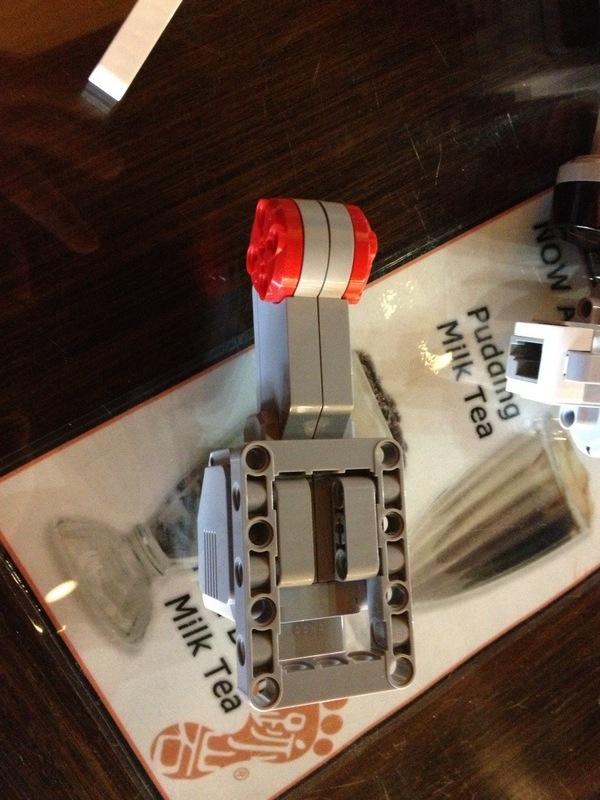 The education kit will include instructions for building modules that can be used in different designs. A conveyor belt doubles as a set of tracks. A motor-wheel module can be built that is sturdy but easy to build upon. This will help students (and teachers) minimize the frustration that inevitably occurs when straying from build instructions to pursue an idea for a new design. The strengths associated with building with Technics parts will be a lot more intuitive to newcomers that may have only worked with bricks. I am excited to get my hands on one of these kits. In my robotics class this year, students grew considerably in their ability to conjure up a design and make it happen with the bricks. Students often got frustrated by the curves of the NXT motors getting in the way of their designs. 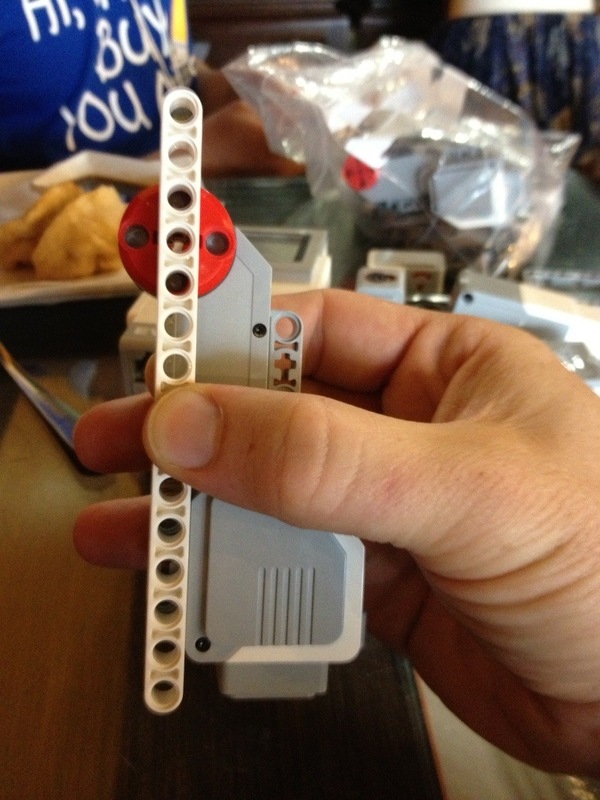 The ease of attaching motors directly to the programmable brick of the EV3 will make it even easier to get students learning programming techniques. The on brick features for prototyping and programming will make things much easier for trying out quick ideas, especially on an FLL field. It was good catching up with Lee - he is a person to watch in the world of LEGO Education. He was at the FIRST World Festival to demonstrate the EV3 to FIRST LEGO League teams, not to mention members of the Board of Directors at the LEGO group. He told me that his plans include photographing Gyro Boy in Times Square and Washington Square Park. Though he assures me that the robot named 'Evan' that has been touring the world to demonstrate the EV3 is not named after me, I'm going to continue to assume that it is. In the Algebra 2 class, we started our unit on solving systems of equations. From a teaching perspective, this provides all sorts of opportunities for students to conceptualize what solutions to systems mean from a graphical, algebraic, and numerical perspective. Some students seem to like the topic because it tends to be fairly straight forward, is algorithmic, and has many ways to check and confirm whether it has been done correctly. a) Estimate the solution of the system. b) Write an equation for each line in standard form. d) Use your calculator and convert these values to decimals. How close are these to your estimate? We had some great discussions about the positives and negatives of graphical solutions to equations. Weaker students got some much needed practice writing equations for lines. For all students, this led to some good conversations about choosing two points that the lines clearly pass through for writing equations (if possible) rather than guessing at the y-intercept. The students also got the idea of how Geogebra can solve a system of equations exactly as a quick check for their algebra, an improvement over substituting (which is at times more trouble than it's worth for students with poor arithmetic) and slightly faster than solving for y on a graphing calculator and finding the intersection. I also like the unit, though I don't tend to like the word problems. It's hard to convince students about the large scale importance of coin problems (especially in an international school with everyone used to different currency) or finding how many tickets were sold at the door or advance since anyone with a brain would just ask the person tallying the tickets. I also found myself thinking about Dan Meyer's post over the summer about how many word problems are made up for the purposes of math, rather than using mathematics to analyze cool situations and create problems out of the situations. Getting students to figure out how to use the math to do this is ultimately what we want them to learn to do anyway. Figuring out when trains pass each other is not exciting to students, but I realized this morning while brushing my teeth that doing this problem with real robots either crashing into each other or racing adds a neat dimension to this problem. The question of figuring out both when they will crash or catch up to each other, and also where they will do so is a clear motivation for finding a solution to a system of equations describing their positions as functions of time. So I gave the students the two robots (videos of them posted at http://bit.ly/vIs0lu and http://bit.ly/u9jSPB) . I told them I was going to set them apart a certain distance that was tentatively 80 centimeters, but said I wanted the ability to change that at any time. I wanted them to predict when and where they would collide. No, you can't just run the experiment and see where they crash. That not only defeats the purpose of this exercise, but we will be doing this sort of activity in a couple different ways during the unit, so being able to do this analytically is important. You also can't run both robots at the same time - that's for those of you that are going to try to be lawyers and break that first rule. You can measure anything you want using any units that you want using either robot individually. At some point, you should be able to show me how you are modeling the position of each robot as a function of time. And I set them off to figure things out. Despite the fact there were only two robots, the 12 kids naturally divided themselves up into a couple teams to characterize each robot, and there was some good sharing of data amidst some whining about how annoying it was to actually measure things. In the end, most students at least had some idea of how they were going to put together their models, and some had actually written out what they were. As one would hope for these types of activities, there were plenty of examples of students helping others to understand what they were doing. The engagement was clearly there, as confirmed by students visibly excited to run the robot and time how long it took for it to move around. It was a fun exercise that I plan to return to in a few ways during this unit - perhaps some interrobo-species interaction (my iCreate robot is charging up as we speak). Fun times. UPDATE: This is the video of the next day's class when students solved their functions. I set the robots apart from each other and the students did the rest.